A common experience after a big night out at a concert or a nightclub is experiencing a sensation of having all the sounds around you seem a lot quieter than usual – your hearing seems dull or muffled, or your ears may feel ‘blocked’. 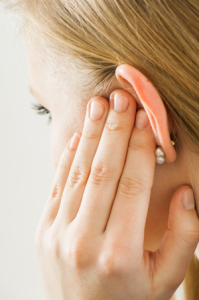 This drop in hearing after loud noise exposure is technically known as a temporary hearing threshold shift. It is believed to be caused by your ears trying to adapt to an over-exposure to loud noise. When your ears go into defensive mode, chemical changes in the inner ear make your hearing less sensitive to sound. This may be a warning sign that your hearing is at risk of noise injury. Temporary hearing threshold shift can last for a few minutes up to many hours depending on the level and duration of noise exposure experienced. If you continue to expose yourself to noise so loud that you experience episodes of temporary hearing threshold shift, there is a chance you will develop a permanent noise-induced hearing loss. Exactly when a temporary threshold shift becomes permanent may vary from person to person, but the more loud noise exposure you have, the greater the chance of acquiring a permanent hearing loss. One of the easiest ways to reduce your exposure to harmful loud noise, and avoid temporary hearing threshold shifts, is to increase your distance from the noise source. For example, moving well away from the speakers in a night club can make some difference to the noise level you experience. Even better, you could also try earplugs. You don’t have to use the fluorescent ones that workers wear on a construction site – there are specially designed earplugs that allow you to listen to music clearly while reducing the volume to a safer level for your ears – and they are small and discreet to wear. An audiologist can make custom fitted ones that are really comfortable to wear and virtually invisible. You can find an audiologist in your state at www.audiology.asn.au.